Enjoy an indulgent combination of a back to back cruise and touring for an immersive Mediterranean experience of a lifetime. Immersive private touring in Italy. Not one, but two Mediterranean sailings with the luxurious MSC Cruises. Return airfares and transfers for your convenience. 7 night Garden, Lakes & Villas tour of Italy. 7 nights aboard MSC Bellissima roundtrip from Genoa with port calls in Naples, Valletta, Barcelona and Marseille. Your cruise includes on board meals and entertainment. Transfer from Genoa to Venice. 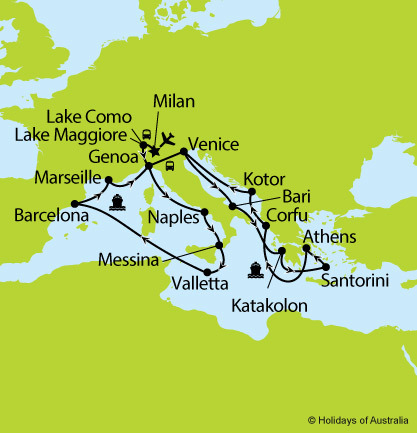 7 nights aboard MSC Magnifica roundtrip from Venice with port calls in Bari, Katakolon, Santorini, Piraeus (Athens), Corfu and Kotor. Your cruise includes on board meals and entertainment. *Departures from Perth are subject to a discount of $200 per person. Gratuities onboard MSC Cruises is not included and will be automatically charged to your shipboard account. Adult - £10 per person per night. Children - £5 per child per night. ^ Discounts per person offers are available on new bookings made & deposited by 31 Mar 2019. Discount has been applied to pricing.